OPPO has just announced a special exclusive promo in Lazada Philippines. You can get both the OPPO F5 and OPPO A3 for the price of one for only PHP18,990. 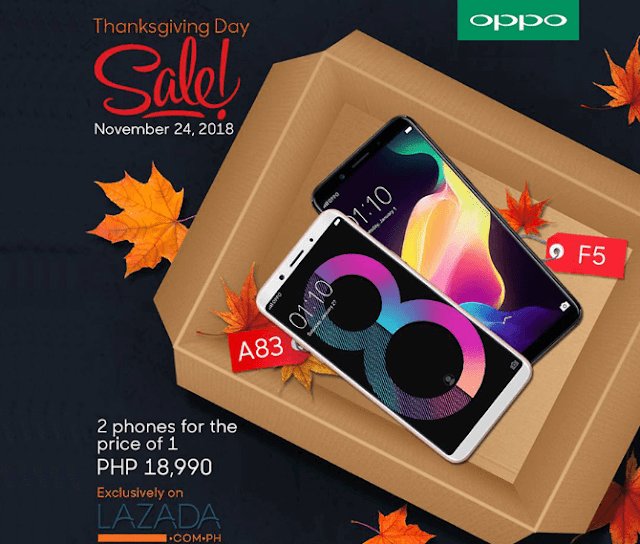 This is OPPO’s Thanksgiving Day Promo that is exclusive on Lazada tomorrow, November 24, 2018. The deal: Buy 2 smartphones for the price of 1. You only have to pay P18,990 for two (2) smartphones. You’ll take home OPPO A83 and OPPO F5. The OPPO F5 and OPPO A83 will be priced at just PHP 18,990. Last time we checked, the OPPO F5 is still priced around PHP 13K and the OPPO A83 costs around PHP 6,990 to 9,990. And to give you a bit of information, the OPPO F5 was launched by OPPO in October of 2017. The SRP when it was launched was P15,990. The OPPO A83, on the other hand, was launched early this year. It simply means you can save at least PHP 2,000 if you buy the F5 and A83 at Lazada bundle tomorrow, November 24, 2018 at Lazada Philippines. The OPPO F5 is the first smartphone of the company with AI face beauty technology and an 18:9 screen aspect ratio. The handset features a 20MP f/2.0 front camera with AI face beauty and a 6-inch FHD+ 18:9 screen. the OPPO A83 on the the other hand,is a smaller device with a 5.7-inch HD+ 18:9 screen. Both the F5 and A83 runs with the capable 2.5GHz 64-bit Helio P23 octa-core processor. The promo is exclusively on Lazada Philippines tommorow, Nov. 24, 2018.